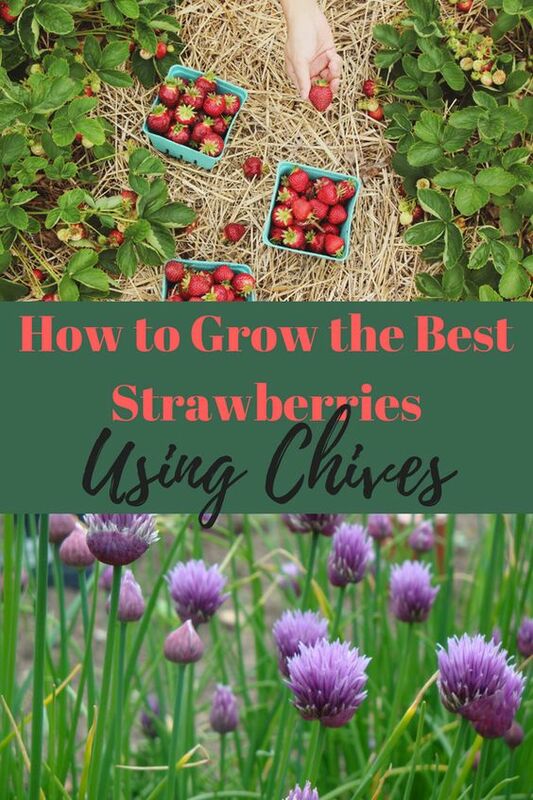 "How to Grow the Best Strawberries Using Chives"
It’s that time of year! Springtime brings strawberries, one of my personal favorites! Let’s learn how to grow the best strawberries using chives! Wha??!! What does chives have to do with strawberries? Everything!! Hang in there with me! A couple of weeks ago, I went out back to take a look at how the strawberry patch was coming along. It’s been a few years…maybe more, since I planted that patch. That patch has been a wonderful supplier of berries for years now. However, I’m sad to report that it’s time to plant new strawberries. Strawberry plants only live 3 or 4 years, and it seems that mine have run their course. Time to plant new strawberry plants! First, you’re going to need some awesome plants. I always order mine from Stark nursery. I do not get paid if you order from them, they don’t have an affiliate program, but you know what? I don’t care! I have used Stark for years now, for all of my fruit and nut trees as well. They have unbelievable customer service and will replace trees that don’t make it. Check them out and you’re welcome. Ok, so here’s my babies and look at those roots! See what I mean about Stark? I like to soak the roots in water for just a few minutes, say 10-15, before planting. While they’re soaking, I made 5 slightly raised rows for my berries, I plan to put 10 in each row. Actually, I completely relocated the berry patch to another part of the property, which is “crop rotation” on steroids! 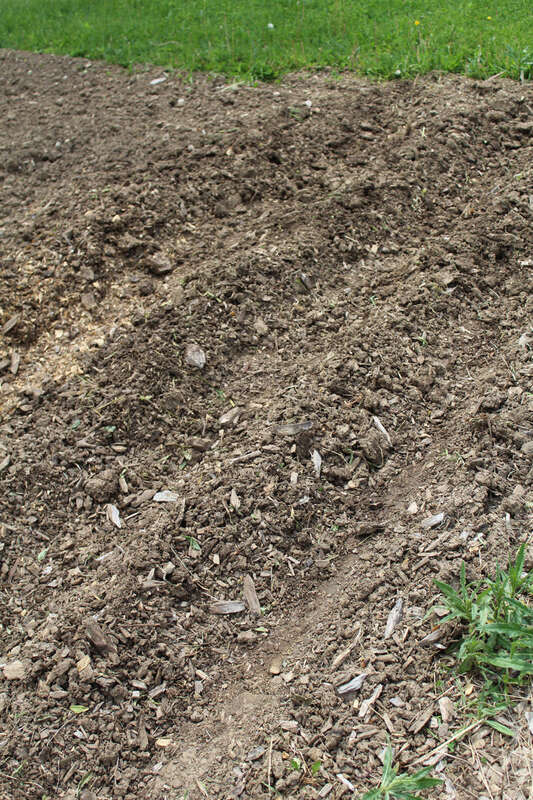 But that allows the last patch to get turned under and fertilized, so it can rest. If you have enough land to do this, I recommend it. At least don’t put it in the exact same place to avoid pests. 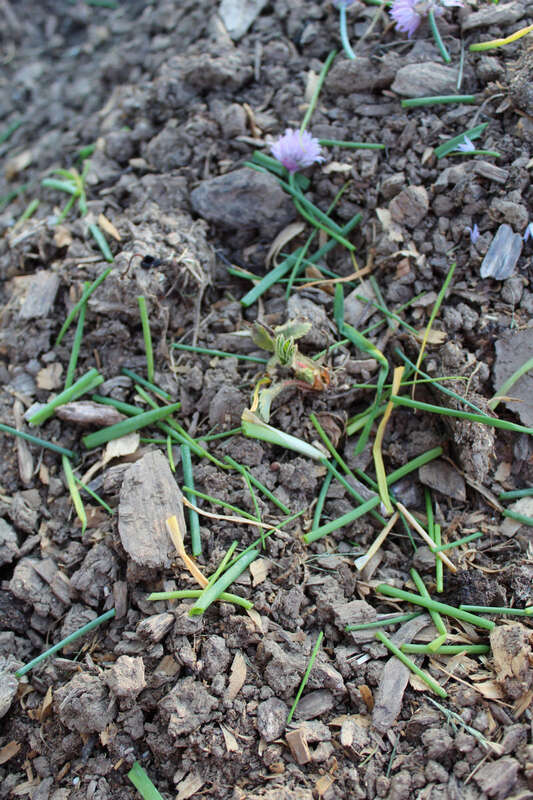 Make sure that your soil has plenty of compost in it already, we want your plants to get a great start! Here we go! Give your plants plenty of space between, I would recommend at least 12 inches. The plants will spread and send out runners, even though they look pretty harmless now. 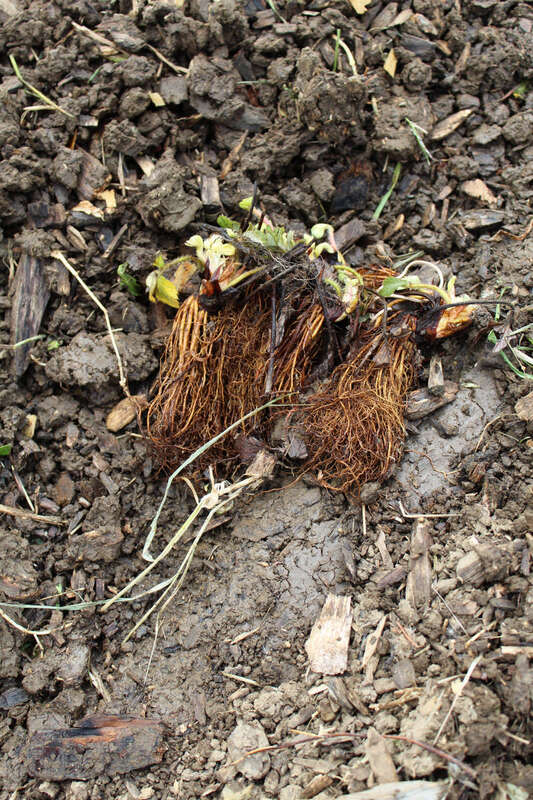 Dig a hole at least as long as the root system, please don’t shove the roots in the dirt and expect them to do well. They need to have loose soil to spread and grow. Hold the plant over the hole, allowing the root system to drop down completely. Then with your other hand, fill the hole with soil, up to the crown, but not above it. Press soil firmly around the plant and down on roots, we don’t want any air bubbles down in there. Now to introduce our chives into this patch! Using herbs to compliment and improve your garden is nothing new, some refer to it as “Companion Planting”. This means that when you plant two or more different plants together, they produce a “homeostasis” between them. One plant brings a nutrient to the soil that the other plant needs, and visa versa. Strawberries need potassium, calcium, nitrogen and magnesium along with some other trace elements, and so guess what chives offer? Yep, potassium and calcium, among other things. Another benefit of using chive in your strawberry patch is that it naturally repels the pests that are drawn to the sweetness of the berries. Chive is believed to repel a number of harmful insects, including aphids, beetles, cabbage worms, Japanese beetles and slugs. 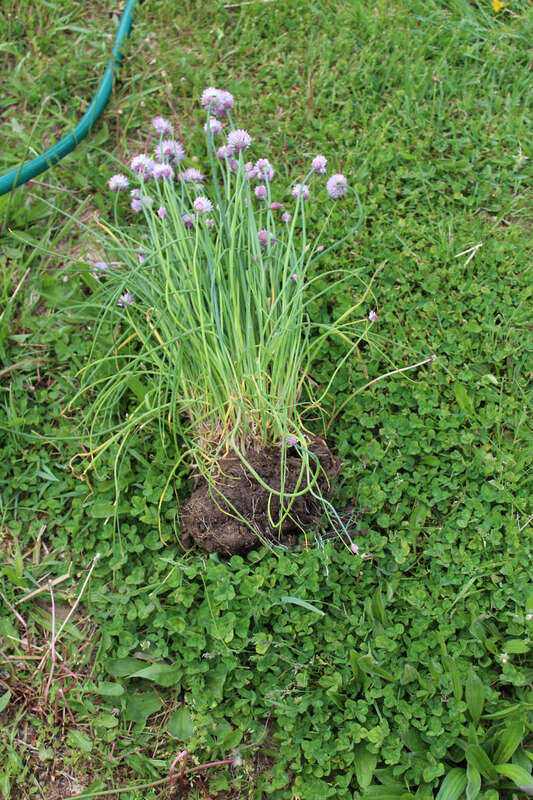 Here, I took a large ball of chives and split it into 5 plants…..
Plant the separated chives within the patch, wherever you desire. I put them right in the center, but you could also put them around the perimeter. 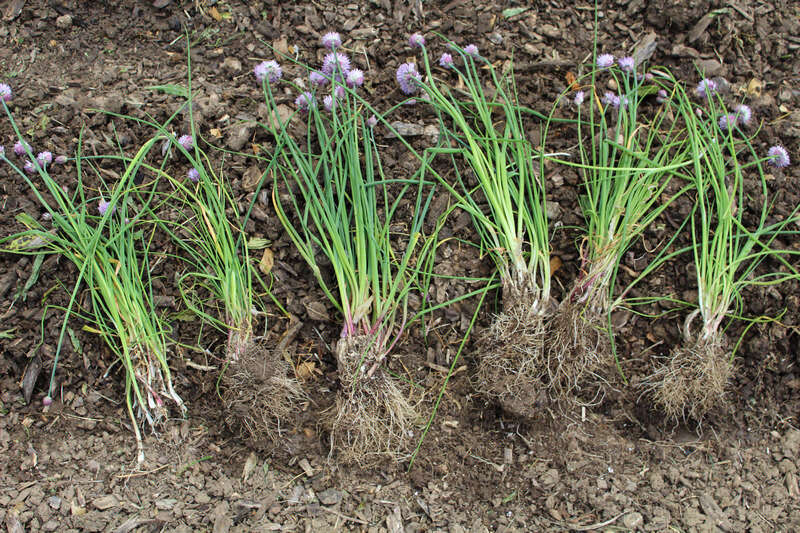 To fertilize your plants with chive, simply “give the chives a haircut”, as you would to harvest for use. Then chop up the pieces and spread around your strawberry plants! That’s all there is to it, nature will take over from there. It remains to be seen if I’ll get any berries this year, but I’d say my chances are pretty good! Now all that remains is to get some recipe ideas for those luscious berries, or maybe freeze some for later! Thank you for sharing this great advice especially since I’m getting ready to plant my strawberry bed in a few days. Now I wish I’d started chives this year! Maybe I’ll just plant some seeds with the strawberries & see how it goes! Hi Jessie! I think planting seeds could definitely work, or pick up a couple of plants at your local nursery. Thanks for commenting and happy gardening! If only I could grow strawberries…. Sadly, each time I try, them stupid deer eat every. single. leaf. Any recommendations for a deer-proof Fort Knox for strawberries? Deer can be very persistent, that’s for sure! I’ve used everything on the market to deter them and had some luck with “Liquid Fence”, but it rains a lot here, so I have to keep reapplying. Deer can jump just about any fence you can install! Corn seems to be the crop that attracts deer to my garden, so frankly, I stopped growing it out in the “big” garden…it just wasn’t worth the damage they did to the other crops! I have grown it closer to the house, within distance of the indoor dogs barking, and had much better luck that way. With strawberries, you could easily inter-plant them with your sun-loving landscaping, I doubt the deer will come that close to your home. Also, you could plant them in containers, either tier or slotted, on your sunniest porch!